Dawei is a sleepy tropical town with a number of beautiful beaches in the vicinity. It has a long history of trade and features some interesting colonial architecture, with many old wooden, thatch-roofed bungalows and some brick and stucco mansions. Under British rule Dawei was known as Tavoy, and is still sometimes referred to by that name. The Shwe Taung Zar Pagoda is the main religious site in Dawei, and is set in a charming little complex. The short walk from the centre of Dawei is also a pleasant one, following streets dotted with colonial era-buildings. In the centre of town, which sometimes feels more Thai than Myanmar, the busy Si Pin Tharyar and Minagalar markets are worth a visit – they can be found opposite each other. For a wider selection of photos, go to our Dawei Flickr photo album. 12 kilometres west of Dawei is Maungmagan beach (also spelt Maung Ma Kan), with its beautiful setting of hills rising straight up from the shoreline. There are a host of simple restaurants serving fresh seafood here and a 30 minute walk south will take you to a characterful fishing village with small boats nestled in its harbour – and some picture-perfect beer stations where you can relax and take in the views and sea breeze (check out our YouTube video from the village). Maungmagan is quite unlike the more tourist-focused beaches you will find on the Bay of Bengal coast. Here, most people are local and bathing practices are somewhat different – you may find the people wading in their jeans and shirts, particularly on public holidays; foreigners in swimwear are not frowned upon, although they may get some friendly attention. One unfortunate side-effect of the lack of tourism development is that refuse is not always cleared; this is not unsafe, but can sometimes be a little unsightly. To see more photos, go to our Maungmagan beach Flickr photo album. There are a few hotels at Maungmagan beach, the best being the Maung Ma Kan Resort (located on the beach) and the more foreigner-friendly Coconut Guesthouse and Restaurant (located 500 metres behind the beach); a tuk tuk to Maungmagan beach will take around 45 minutes from central Dawei and cost K10,000. Dawei itself has a wide choice of hotels. We offer a variety of tours of Myanmar that include Dawei, its beaches and the surrounding area - find out more here. There are a number of stunning, untouched stretches of coastline to be discovered in the area. Whilst Maungmagan is popular and fun, it can get busy at certain times of year and the sand is not perfect. But near Dawei there are dozens of idyllic white sand beaches where you are unlikely to see another soul (other than the odd fisherman), particularly on the peninsula towards Dawei Point. San Maria Bay. Around 45 minutes to the south of Maungmagan, this beautiful spot is located on the road to the Myawyik Pagoda (which, if you are looking for directions from a local, is the name you should use); the shrine itself is on a headland 500 metres to the north of San Maria Bay, and stretches out to sea on a long footbridge that can be a seen for miles around. A charming beer station can be found at the north end of the beach, on the road that continues to the pagoda. Teyzit beach. Located further south, this gorgeous and pristine beach makes for a full day trip. From Maungmagan, you will need to drive south, beyond Dawei, to Launglon village (which has a number of little teahouses for refreshments). The turning to Teyzit beach is 15 minutes further south, then you have to drive half an hour westwards on a rougher road through the mountains, which open out on to Teyzit beach. Again, there is a small village with a beer station at the north end. Watch our YouTube video from Teyzit beach. Nabule beach. Away from the Dawei Peninsula, this seemingly endless and empty stretch of brilliant white sand can be found 18 kilometres north of Maungmagan. At the north end of Nabule there is a hillside pagoda with a small restaurant nearby, which offers great views along the beach and out to sea. Check out our YouTube video from Nabule Beach. You can get a taxi or tuk tuk, but the freedom of exploring by motorbike is the best way to get to these places; they can be hired in Dawei and at Maungmagan, costing around K10,000 per day. If you head to the Dawei Peninsula, it is important to note that there is little infrastructure in the area – the roads down to the beaches are bad (and hard going in parts) and the habitations are mostly simple fishing villages where you may be able to buy fried rice and a drink, but little else. Most accommodation is in Dawei or at Maungmagan beach, which are both within day-trip reach of the whole peninsula - but there is also some simple beach hut accommodation to be found on the peninsula. The Moscos Islands, a string of small and unpopulated islands roughly 15 kilometres off the coast, is a fantastic excursion replete with remote, white sand beaches and clear, turquoise water. Though for years off limits to tourists, these virtually untouched islands can now be reached by hired boat from Maungmagan village. Check out our YouTube video of the islands. For a wider selection of photos, go to our beaches in the Dawei area Flickr photo album. 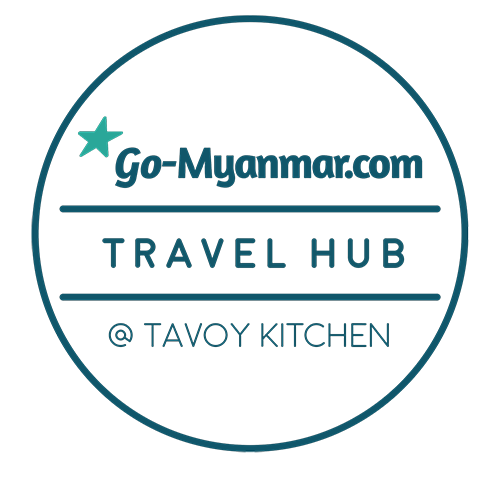 Tavoy Kitchen, in the centre of Dawei, hosts the Dawei Go-Myanmar.com Travel Hub, an information centre for visitors to the Dawei area. You can book local activities such as city tours, cooking classes, beach tours, motorbike hire and more – as well as consult the friendly staff about wider Myanmar travel. Bus, flight, taxi and hotel bookings are also available through the Travel Hub, which is open daily 10am to 10pm (it is closed during low season from June to August). . In Dawei, a Visa- and Mastercard-ready KBZ bank ATM can be found at 14 Neikban (Niban) Street, which runs parallel and to the north of the main east-west thoroughfare, Arzarni Road; there are a number of other banks and ATMs dotted around the downtown area. If you are going to explore the beaches around Dawei, it is a good idea to have a mobile phone with GPS and pre-load maps of the area so you can use them offline if you are struggling with directions. There is a Thailand border crossing point in the hills five hours to the east of Dawei at Htee Kee/Phunaron; for detailed information, go here.